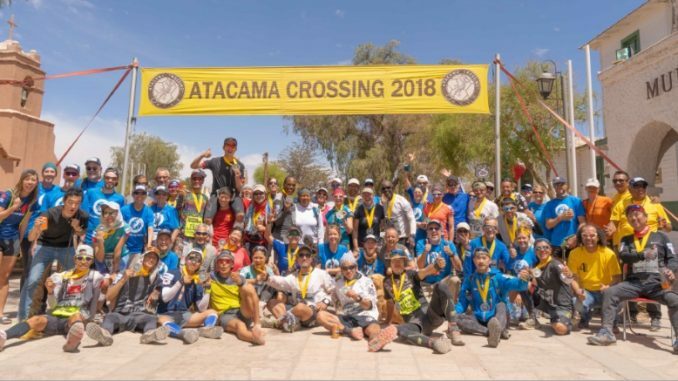 The Atacama Crossing is a 250 kilometer/155 mile, six stage, self-supported ultramarathon across the Atacama Desert in northern Chile. Organised by RacingThePlanet, the 4Deserts race series captures the imagination with a variety of locations and environments that have forged a community that attracts competitors from across the board in terms of individual capacity. The race starts in the Arcoiris Valley and gradually descends over the six stages to finish in San Pedro de Atacama at an elevation of 2,400 meters (7,900 feet). Most of the stages are round about the marathon distance and the long day was the 5th, some 76 km. 93 finishers from 106 starters. Ho Chung Wong (HKG) won every stage finishing almost 5 hours ahead of second placed Takuya Wakaoka (JPN). In the women’s race after stage three, Lara Reynolds (RSA) was 42 minutes adrift of the then leader Denise Le but great performances on the long day, stage 5, lifted Victoria Connelly (GBR) into second and Reynolds into first place which she maintained on the final short stage to take the win.